The meet was held at the Heart of Virginia Council, Camp T. Brady Saunders which is the Council's Boy Scout Resident Camp. 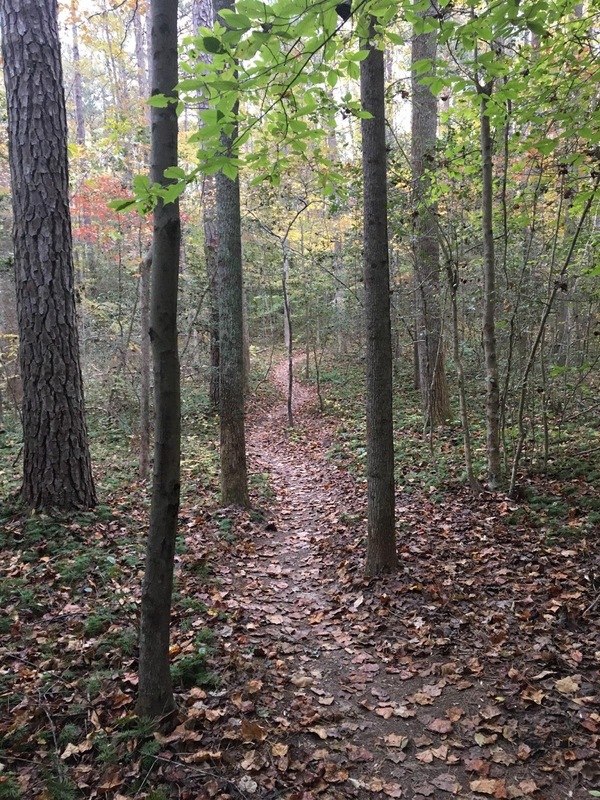 The camp is 720 acres of rolling Piedmont woodlands with two lakes (Dillon and Olga) and numerous streams that cross the property. Mark Walmsley was the course setter. 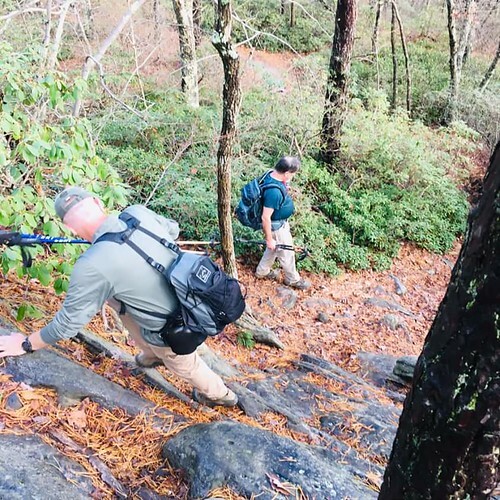 The advanced course covered both the traditional Boy Scout and Cub Scout camps. I think any of us that spent and time as a Scout or a Scouter find Camp T. Brady Saunders a special place. Out on the course I remembered my time as a Scout going through my OA ordeal and providing selfless service to the camp. Can't forget Ranger John and his stories at the camp fire. Pictured above is the start/finish line at the new STEM center. Both adventure racers and foot orienteers tell their war stories from the course. 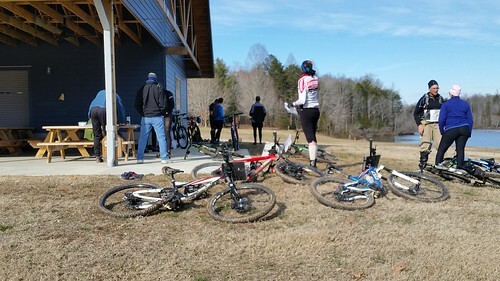 (12 racers did the Diet Adventure Race Course. 6 Beginner, 11 Intermediate, and 9 Advanced did the foot orienteering courses). The advanced foot-O course was 7.1 km point to point. I am sure I covered more distance than that... What can make this course difficult is the mass of network of trails and the fifteen campsites. Looking at the map each one of the dotted circles is a Troop campsite area. It might have taken me more time of using the network of trails but I found this to be a easier process for me. I am not going to point it out on the map but one of the features is the OA circle. Only members of the OA know where the OA circle is located. If you took the same route I did you might have passed by this area. The one navigation error I made was at control 12. I came in to control 12 from the power easement and the trail just above the #12 on the map. I was just north of the blue square and had to work my way down to the control. It took me a minute or two to figure out the terrain feature from control 12 to control 13. On the map you will see two rows of green dots just right of #13. Its a parking lot with trees in the lot... So what are some lessons learned for me? I used a new compass for the first time. Don't do this on the course! More cross country running. I can say this enough! Study features and get better reading the map as I go. You don't see to many of these features on a orienteering map but there is a rifle range on there. 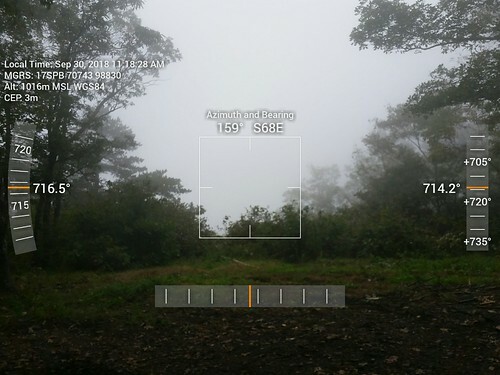 Can you find the rifle range? 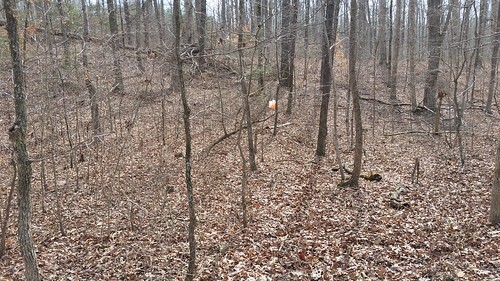 CVOC held its 1st Day Orienteering Meet in conjunction with the 1st Day Hike event held at Pocahontas State Park. With the mild temps and a break in the rain we have been having, the park was full of people enjoying the 1st day of 2019. There were 92 plus participants with 42 starts on either the traditional beginner, intermediate, and advanced courses. 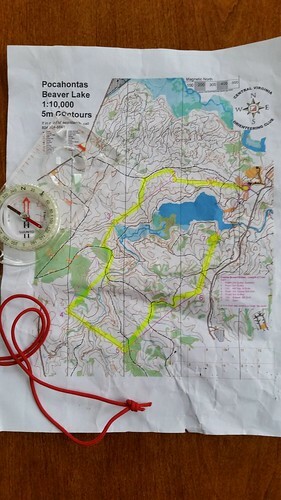 Each course was to be completed in the numerical order indicated on the map. As always club members provided beginner instruction or anyone that needed a refresher.Course designers were Tim Gilbert and Alec Richardson. Pictured above is my advanced map of the course. There were only 7 controls on the 4.7km course with distances between 700 and 800 meters on some of the longer legs. Four of the controls were 4x4 post with punch which are part of the permanent orienteering course in the park. Leaving control 4 I hit wide creek along with one of the other participants. No matter how you tried you were going to get wet at some point. I think the creek was about 10ft wide at the point that I crossed. I encourage you to get out and try orienteering. If you spend anytime in the great outdoors you need to practice your map and compass skills and a orienteering meet is a great way to do just that. The image of a medieval warrior swinging a broadsword comes to mind when I say Dragons Tooth. But the Dragons Tooth I am talking about is part of the Virginia Triple Crown. 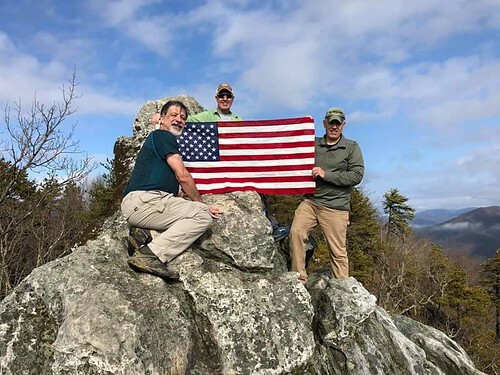 Located just west of Roanoke Virginia on Cove Mountain, Dragons Tooth is south of McAfee Knob and Tinker Cliffs which make up the iconic Virginia Triple Crown know for their incredible vistas. 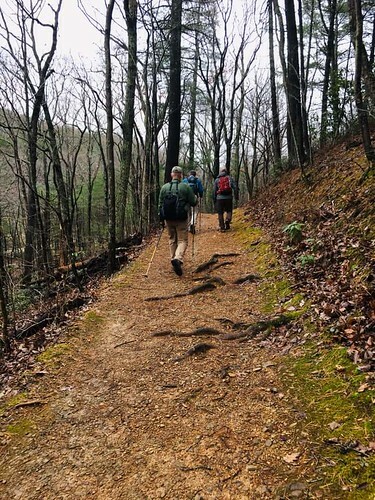 On this day, a group of us gathered at the trail head parking lot to do this hike as a day hike. 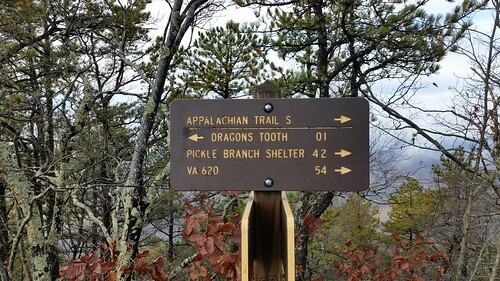 While we made it a circuit using the Dragons Tooth Trail (blue blaze), Appalachian Trail (white blaze) and the Boy Scout ConnectorTrail (yellow blaze). You can make it an out and back hike or counterclockwise from what I have listed above. 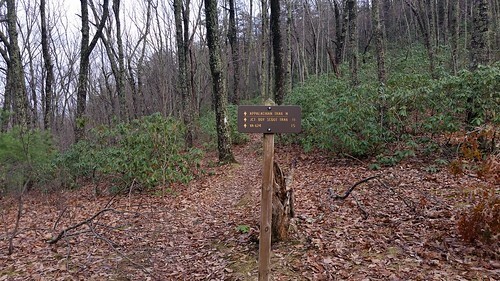 While both of these pictures show a easy trail for hiking (Dragons Tooth Trail) this changes once you hit the saddle where Dragons Tooth and the Appalachian Trail meet. 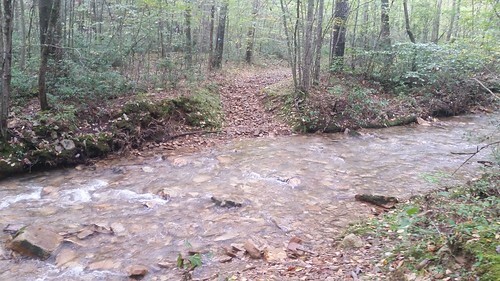 You will also cross the creek 7-8 times while hiking the Dragons Tooth Trail and is the only water sorce in the area. 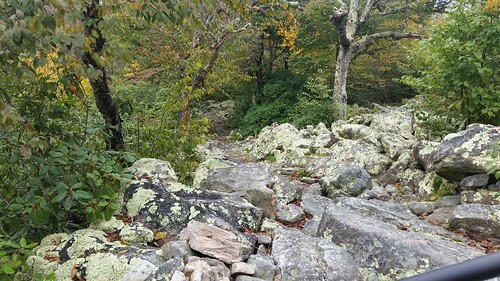 ** A word of caution ** while this hike is only around 5 miles it will take you about 4 1/2 hours to hike. So be prepared! Pictured below is where the fun begins and I would rate this scramble as a 2 on the rating scale. Maybe a 2 plus in spots. I also caution you to look for the white blazes to stay on route. 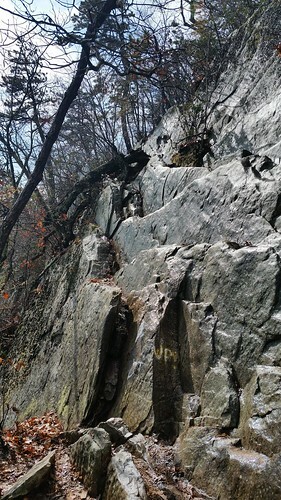 The tooth is a monolith of Tuscarora quartzite. 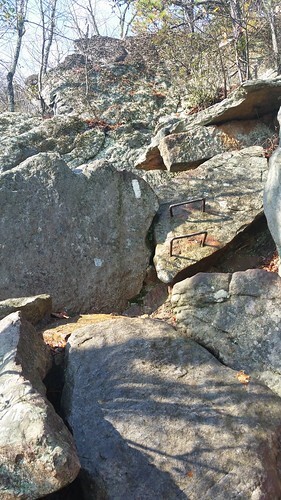 Find a good spot to drop your gear before climbing. 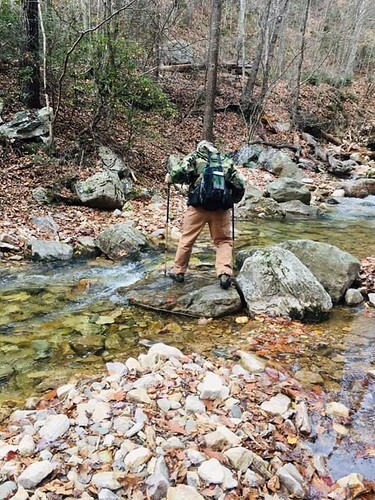 There’s not a lot of room on the rocks and a shift of a pack is something you don't need while you are up there. While it's nice to eat lunch with such a great view, it's best to eat where you dropped your gear. The view up the valley is amazing! From here you have North Mountain on the left of the picture. 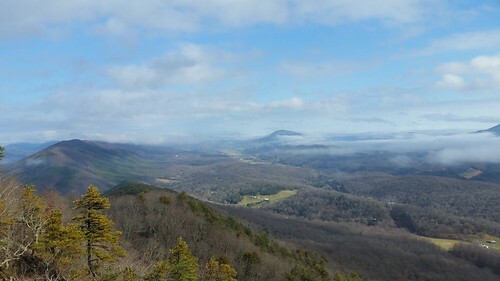 The high mountain top above the cloud is McAfee Knob which is the most photograph point on the Appalachian Trail. 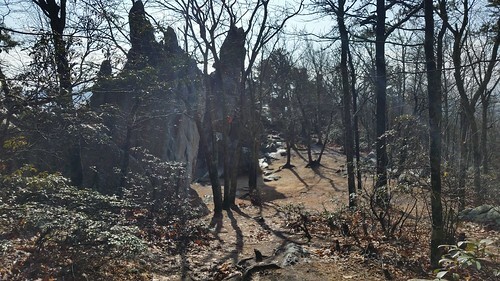 Between thesets to points and what looks like a grey cloud in the picture is Tinker Cliffs. If you where to do the Virginia Triple Crown you would cover all of that area and makes for a 37 mile loop. Wingnut Enduro, A Five Year Review! 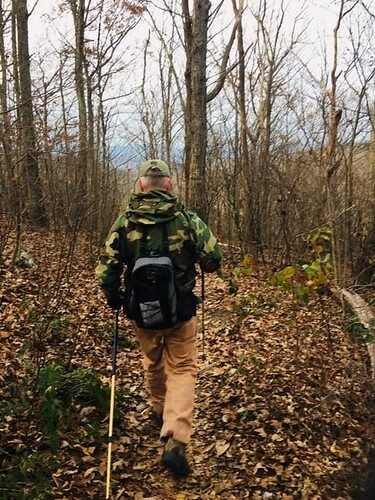 Back in March of 2013 I did a post on my then new Wingnut Enduro pack. http://bikewright.blogspot.com/2013/03/wingnut-enduro-lets-take-close-look.html. Five plus years later, I believe it's time to give a true review of the pack. First of all, the Wingnut Enduro is a hydration guide pack that will hold a 3L bladder. It weighs in at 20 oz and is 1200 cubic inches. It has two side wing pockets and mesh on the outside of the pockets. The outside of the main compartment has a mesh pocket with an elastic draw cord system. When riding on my local trails I normally just ride with bottles. My plan for using this pack was for epic rides and bikepacking. I have used it many times during orienteering events. It has been used on trail maintenance work days and a few day hikes. It was not until I used the pack on a hot trail maintenance day did I truly appreciate and understand the lowrider system. 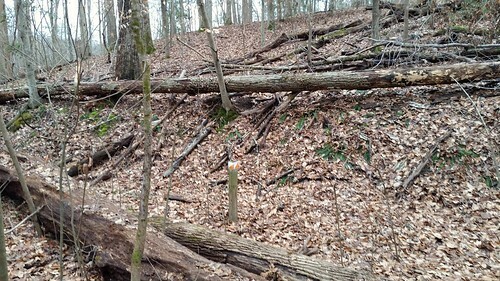 I was reworking a small section of trail and I was bent over for long periods of time. With the lowrider system of the pack I didn't have the weight of the pack on my upper back. I also had freedom of movement and you just don't notice the pack is there. If you have spent any amount of time doing trail maintenance you will understand that you are working with the tools and making the same movements as a wildland firefighter. If you research wildland firefighter packs you will see they also use a type of " lowrider system". As the saying goes "one is none and two is one". I don't know about you, but I have had a bladder fail before! The two times that this happened I remember it was the bite valve. Once you have a failure with a bladder there is not much you can do with it! So with that I am a little old school and still like to carry a Nalgene bottle with me. 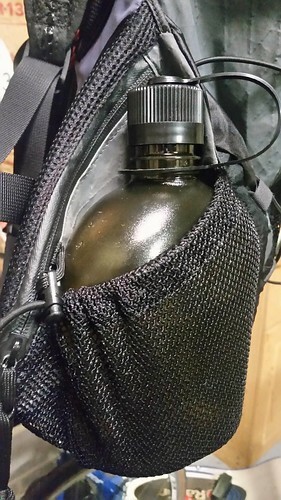 A Nalgene bottle eats up a lot of that 1200 cubic inches of space! While writing this review I wanted to try something to see if it would work. On the outside of each wing pocket there is a mesh pocket. A standard 32 oz Nalgene bottle is too tall for that pocket. But a 32 oz Nalgene canteen is spot on. I will be doing another day hike it 2 weeks and will give the canteens a field trial. **Update** Field Trial- Picture below you can see that I have the Nalgene Oasis Canteen in my left mesh pocket. I was very pleased with how the canteen fit in the pocket. The canteen stayed put until I reached to get it out of the pocket. Had no issues to put the canteen back and could do so one handed. If I am using my Wingnut Enduro on my local mountain bike trails I normally carry about 2 liters of water, a Gerber hand saw, tool kit, small first aid kit and mini pump. That does not come close to filling the pack up! But a epic mountain bike ride or a day hike where you need to carry more gear then 1200 cubic inches can be a challenge. Also remember this is a hydration pack not a 2400 cubic inch day pack. This is where knowing your gear and packing smart plays a big role. No matter if I am riding or hiking in the mountains I carry the same equipment other than the addition of a bicycle repair kit. The elastic compression system on the back is a great place to stick a layer when you get a little warm from activity. The only down side to the elastic compression system is that you can hook it on the front of your saddle when getting on the bike. While no pack rules them all, I can say the Wingnut Enduro fits the bill for me. I just can't come up with anything that is a show stopper on this pack. You can get stuff out of the wing pockets without taking the pack off. Gives a great center of gravity that does not through you off while riding or crossing a stream. Makes you pack only what you need! There you have it, until I see how the water bottles work with it! No matter your pursuit I hope you have been able to get out and enjoy the fall colors. This section of trail is one of my favorites in the fall. A forest floor covered in running cedar with a touch of yellow from the hickory trees. 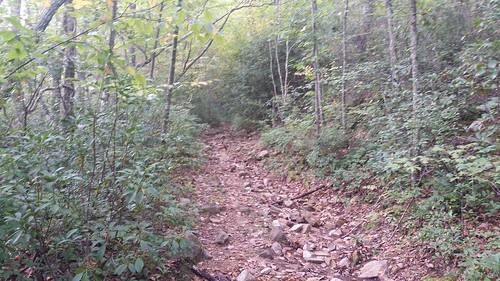 I guess another thing that makes it special to me is that my friend Dartman and I built this trail. We actually cut this backwards from the direction that you ride it. It has changed a little over the last 23 years due to repairs but still has the flow that we put in it. Getting it in when you can get it in seems like the standard mode of operation for me these days. Days are packed working and just doing what needs to done around the house, just to set yourself up for the next work week. But as the saying goes "The mountains are calling and I must go". After what seems like weeks of rain, it hits me that I need to take my bike to the mountains. Without much planning I figured I would go ride Sherando Lake Recreational Area. As I got up Sunday morning I downloaded two GPX files to my GPS and figured I would take one of the two routes. I also loaded the GPX files to RIDEWITHGPS.COM and shared the two routes via email to my wife and a friend to let someone know where I would be for the day. After a couple of hours driving I find my parking place in a small gravel lot off of fire road 42 or Coal Road. From this point my adventure starts. Its not long before I realize that my GPX file is not quite the same route that I am taking... I have done this part of the trail before so it's no big deal. The first part of my route follows Turkey Pen RidgeTrail which is an old road filled with big mud puddles. At some point Turkey Pen Ridge turns into Mill Creek Trail and I am greater with five stream ford's over the next couple of miles. In the picture it doesn't look deep,but each stream ford ended up knee deep at some point. I have never ford a stream here that the water was not deep or fast moving. Glad I packed a spare set of socks to change into at the top of the mountain. After about six miles of riding I come to my first climbing challenge. A series of switchbacks which you climb 1000 vertical feet in a mile. 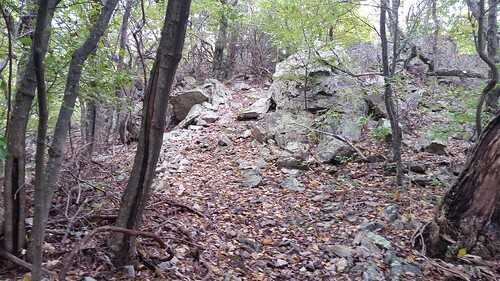 It has always been a goal of mind to be about to climb all of this section. I am far from reaching that goal... But as I climb I see there is a cloud covering the top of the mountain and I was sure the view from the overlook would be hidden from me. While my view was gone it was time to eat lunch and put on a fresh pair of socks. 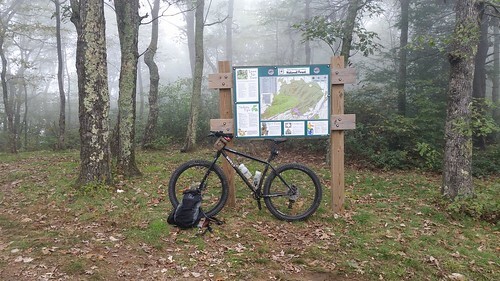 At this point I figured the Blue Ridge Parkway also had clouds on it and it might be too dangerous for me to ride a few miles since I did not have any red blinking lights so drivers could see me. I made the call that I work ride back on Torry Ridge. I am sure at sometime it my life i had ridden Torry Ridge but I don't remember it. Now I do! Yep, I think I rode as much as I hike-a-bike the trail. 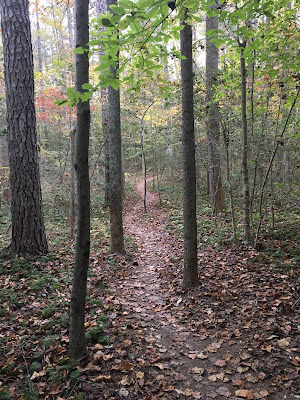 There are a few trails off of Torry Ridge that will take to to the campground and lake area of Sherando. 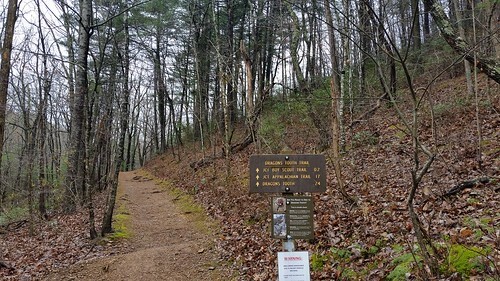 Once I got to the end of Torry Ridge (which seemed like hours) I took a left which the trail sign said would take me back to Mill Creek Trail. This park of the trail was not on my GPX file but I was heading in the right direction. Soon I came to a intersection which I had not been on. At this point I started to wonder where I was and how far I was from my car. This was a point that I just needed to stop and filter some water and think about which way to go. While drinking some water I pushed the page button on my GPS to the compass page and saw I was two miles out from my starting point. So I had a 50/50 shot either way I went. Back on the bike the distance starts to count down and I come out at Sherando Church which is about a mile down the rode from the car. I roll-up back to the car only to find my friend and the guy that I purchased the Surly from. Glen from Shift Bicycles. Glen and his buddy had just finished up the Blue Ridge Wargler. This is a route that I want to do in the spring. It was an epic day for me and I look forward to sharing another one with you.